If you're looking for best car wax, car polish or car shampoo, you've come to the right place. We stock a large range of car care products and accessories. At Motorgeek, we proudly refer to ourselves as car care geeks, offering a huge range of products from the World's leading manufacturers and only offer products that we genuinely use on our own cars. Developed by Jescar and formerly Menzerna USA Power Lock. Jescar is the same product you know and love; just a different name. Lock out contaminants and lock in the shine! Jescar, the maker of fine polishing compounds, offers you another innovative option for paint protection: Jescar Power Lock Polymer Paint Sealant. This high gloss, low effort sealant locks out environmental contaminants and UV rays to preserve your vehicle's clear coat in pristine condition. Fast application and rewarding results will make Jescar Power Lock Polymer Paint Sealant a staple in your detailing collection. 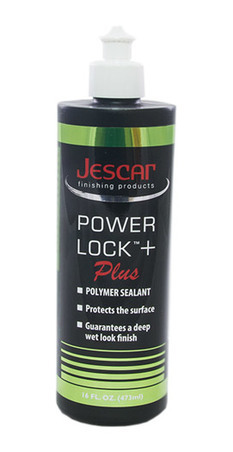 Jescar Power Lock Polymer Paint Sealant is a sophisticated blend of polymers that block out the elements. With a new or newly reconditioned paint finish, you want the most effective paint sealant you can get together with the fastest application possible. With Jescar Power Lock Polymer Paint Sealant, you get both. Jescar Power Lock Polymer Paint Sealant offers the latest polymer technology that not only lasts longer, it feels slicker to the touch. While it's blocking UV radiation and environmental damage, it's also keeping the paint cleaner with a super slick finish. 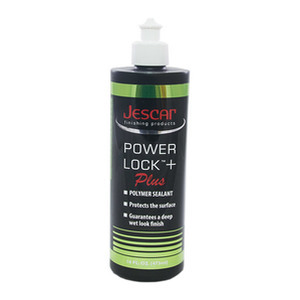 Jescar Power Lock Polymer Paint Sealant is totally synthetic so it stands up well to regular washes and rain showers and it keeps on protecting your vehicle. Jescar Power Lock Polymer Paint Sealant can be applied by hand or with a polisher. Use a foam finishing pad to apply. Then buff using a soft, Microfibre Polishing Cloth. Jescar Power Lock Polymer Paint Sealant is a great choice for a vehicle that is in new condition or one that has just been reconditioned using polishing compounds. You'll be impressed with the speed, shine, and slickness of Jescar Power Lock Polymer Paint Sealant. Then you'll be hooked on the outstanding paint protection. Copyright © Motor Geek All rights reserved.